Today marks the two year anniversary of bringing our Shasta home! Most of that time has been spent alternatively storing it through the cold, long Wisconsin winter, and having it in shambles across my yard, garage, and driveway. After finishing it August, we have gotten to take it camping four times now (check out my post on Symco to see the highlight of our summer!) 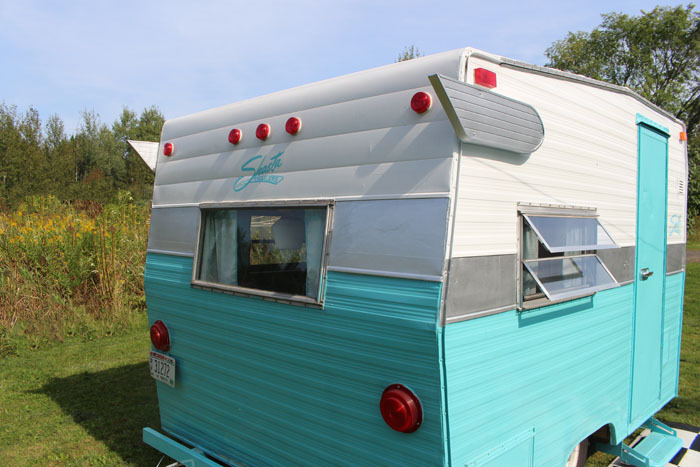 and we’re bona fide Shasta enthusiasts now (or, as my husband remarked to his brother this weekend: “vintage camper people are more our people than you guys are.” ha!). 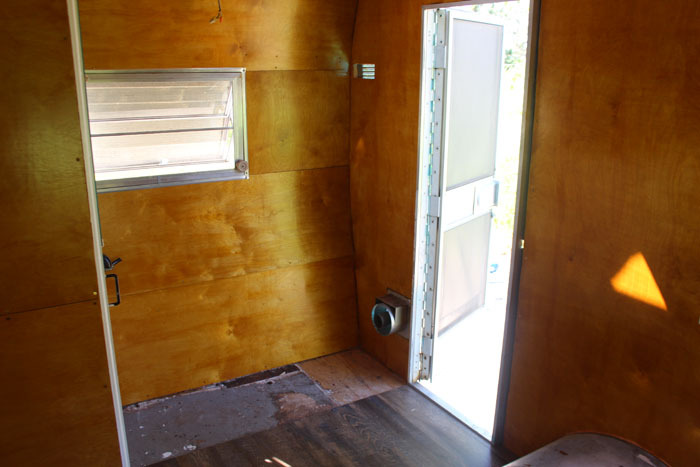 If you missed my Part One post, that one showed off the interior renovation. Now I’m going to talk about what we did to spruce up the outside. You might notice that the colors are awfully similar, haha! I have to say, we were SO indecisive on what color to paint the beast. It was ALMOST painted burgundy. Also, ALMOST like a navy blue. There was some semi-serious talk about both yellow and hunter green. And don’t even get me started on the stripe— to follow the original set-up or paint a Z stripe was a heated debate for a long time. In the end, we decided to keep with the original lines. And we settled on the turquoise. It really is a great pop color. The original, official Shasta turquoise was a lighter color than this, and I wish our paint had ended up a little closer to that but oh well. 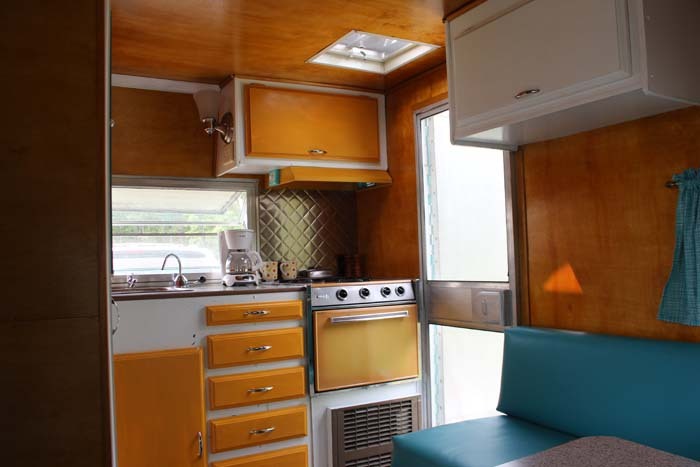 As far as original colors go, our particular Shasta was actually cream colored on top and bottom, with the stripe painted gold— pretty low key, nothing flashy about it (it seems like most of the early 70s Shastas were pretty drab in this regard). 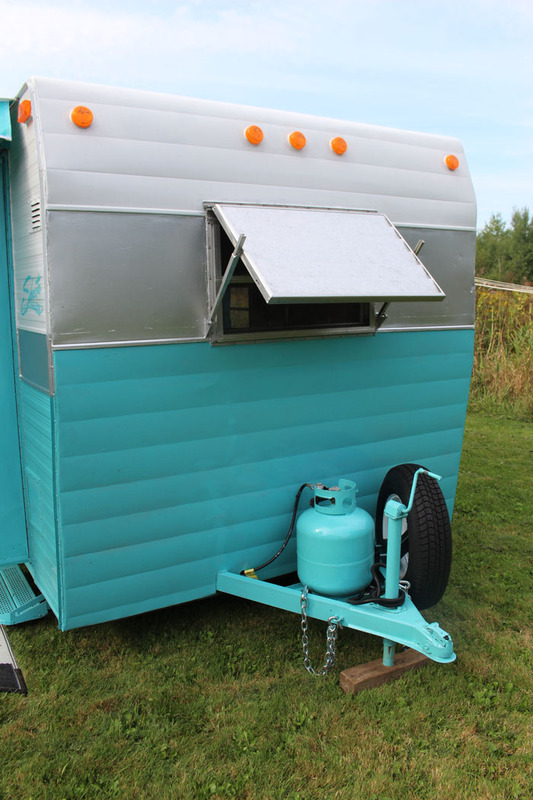 Everything was repainted on the outside, top to bottom, including the hitch, hubcaps, and propane. 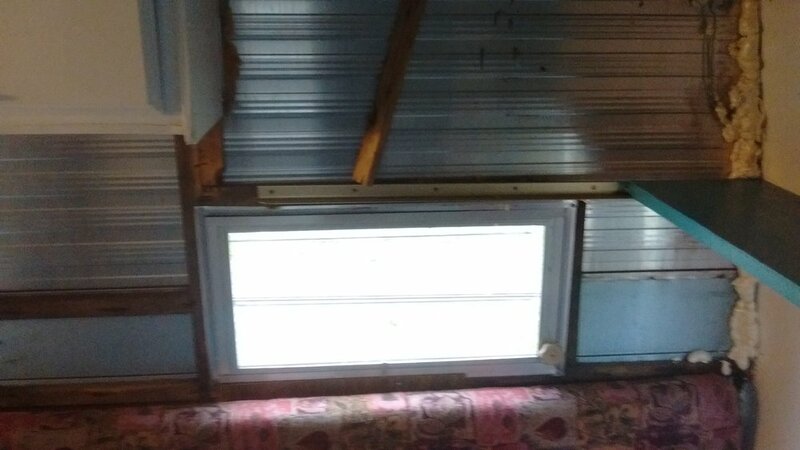 Reinforced the front wall where the kicker plate would be, and fabricated a new piece of aluminum. 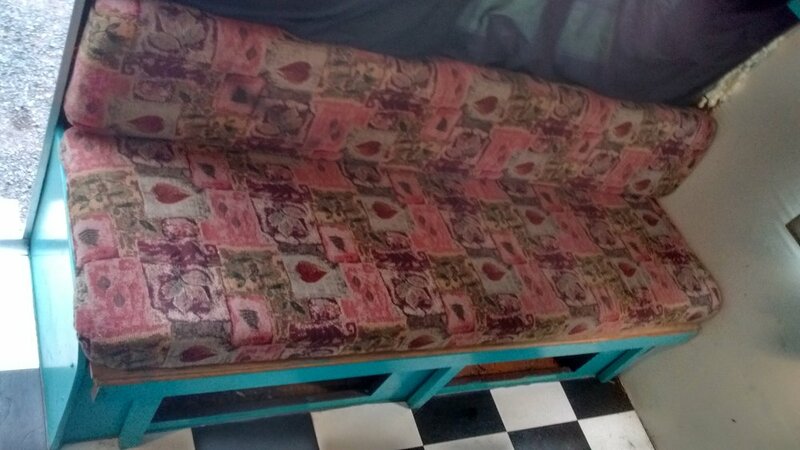 Previous owners had patched and replaced sections of this front wall (next to the hitch) and our local shop wasn’t able to recreate it for us, so Mike fabricated it, and scored a 4 inch break pattern on it. At some point in the middle of all that, we rewired all the exterior lights. It was a giant pain. Honestly, one of Mike’s least favorite parts of the whole project, I think. 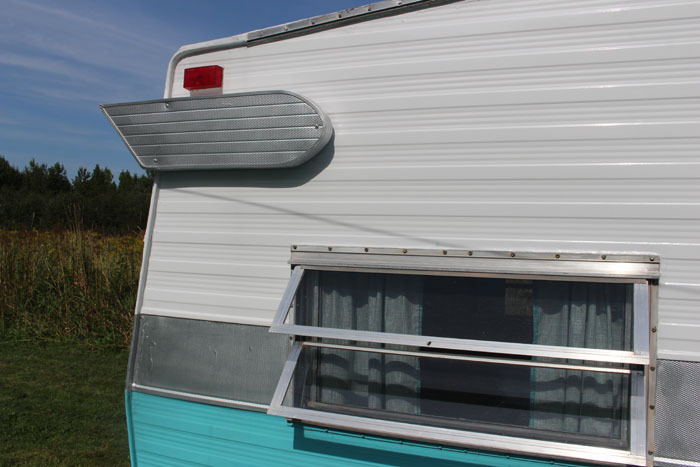 We weren’t able to locate repro starburst lights (the manufacturer that Vintage Trailer Supply uses recently stopped making them, and the VTS crew was looking for a new manufacturer), so we ended up with cheaper lights from Menards. As far as painting goes, first we wet sanded the whole thing— sanded it down using 220 sandpaper and a spray bottle, followed by a dish detergent scrub down, and a final rinse with the hose. For paint, we used Rustoleum Protective Enamel (here’s the metallic silver color we used for the center stripe and the wings— it looks great painted on). 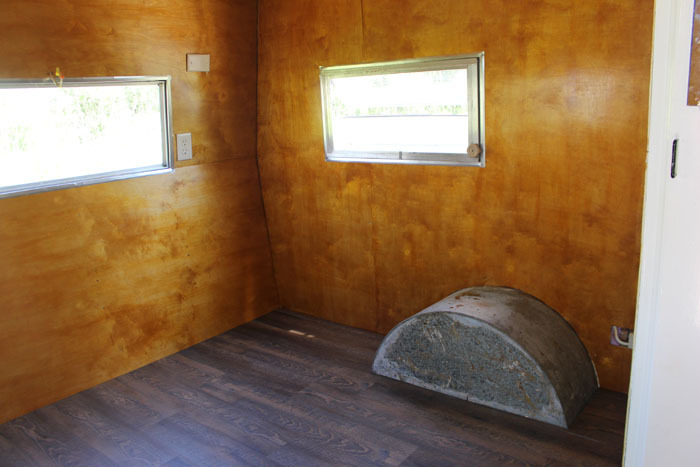 I think it’s an extremely good option for the DIY crowd; those who aren’t springing for a professional paint job. 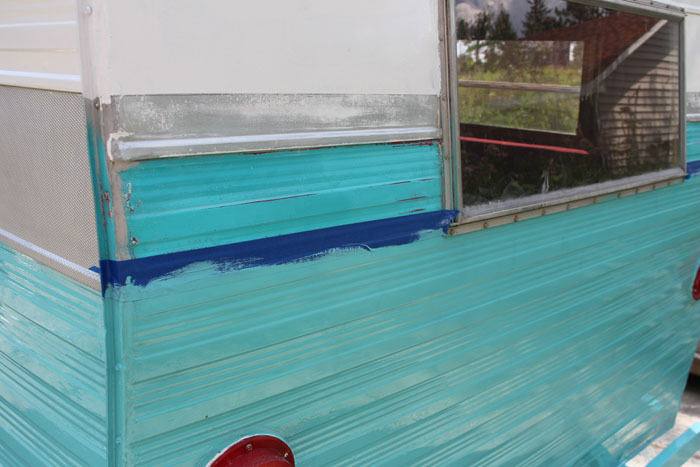 We didn’t prime it, and only did one coat, along with a little bit of touch ups (but we were also painting similar colors on top of similar colors). We used a combination of rolling and brushing. Okay, here’s a mistake we made and then switched back again, haha. So, the center stripe (the one we painted silver): Why isn’t that stripe in the middle a straight, continuous line across all four sides? Why are the center stripe panels on the front and back higher up and wider than the stripes on the sides?! This drives me absolutely nuts! 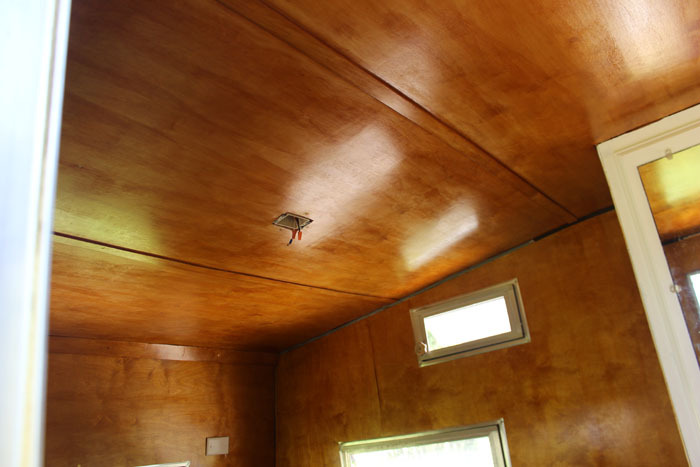 And I noticed some people ignore the paneling and paint whatever they want. Z stripes, triangles, etc. And some people paint it so there is one straight, continuous line across all four sides. I talked Mike into us doing it that way. Taped to paint the silver straight across. As soon as it was done, I said, “I’m sorry. I was wrong. We need to change it.” I hated it. It looked so dumb. So, yeah. 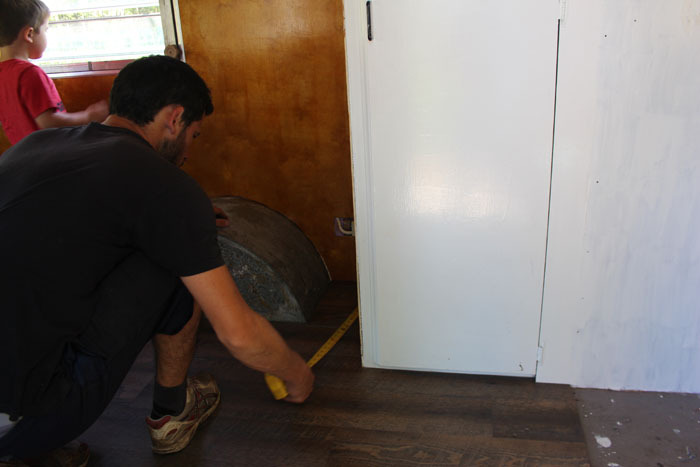 We switched it back to painting it following the lines of the paneling. Much happier. We picked up the awning from Vintage Trailer Supply (really happy with the quality of the product), and the black and white checked mat from Amazon. If you didn’t see Part One, pop over and check out the interior! 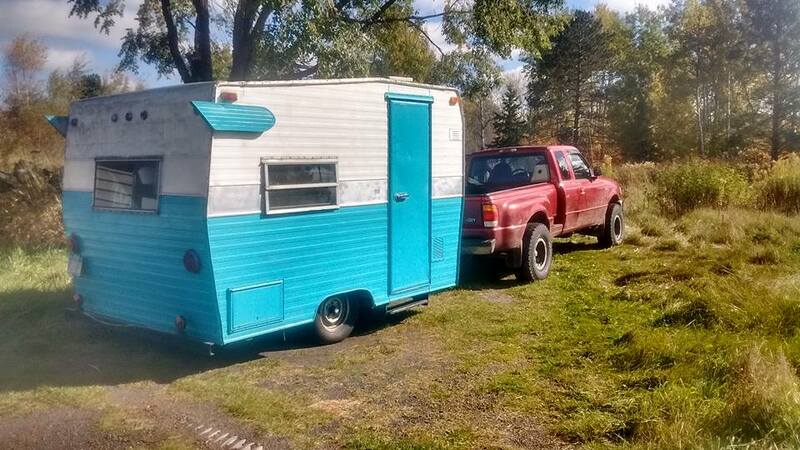 But that said, we’re still always looking at buying another camper project . . . so . . . yeah. It’s addictive. Be careful out there. This was a long time coming, friends. We finally got our 1972 Shasta out on the road. And we picked one heck of an event to debut her at! 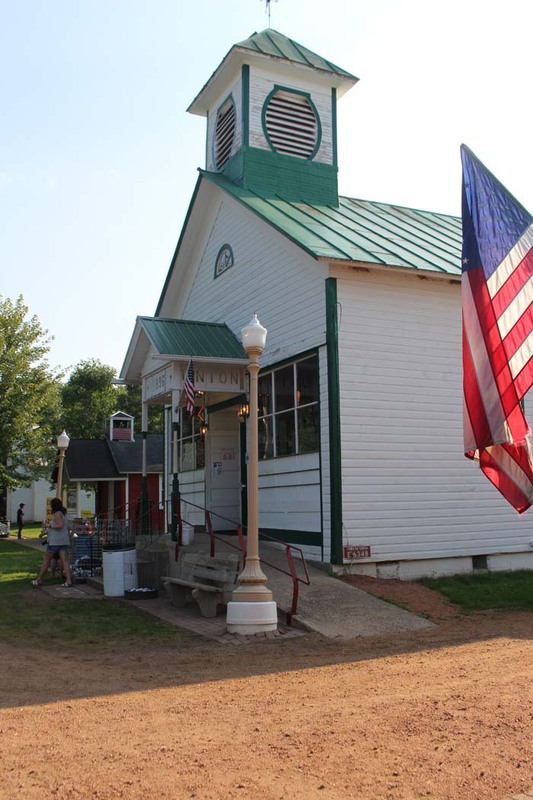 Symco Weekender is in the small, unincorporated town of Symco, Wisconsin. 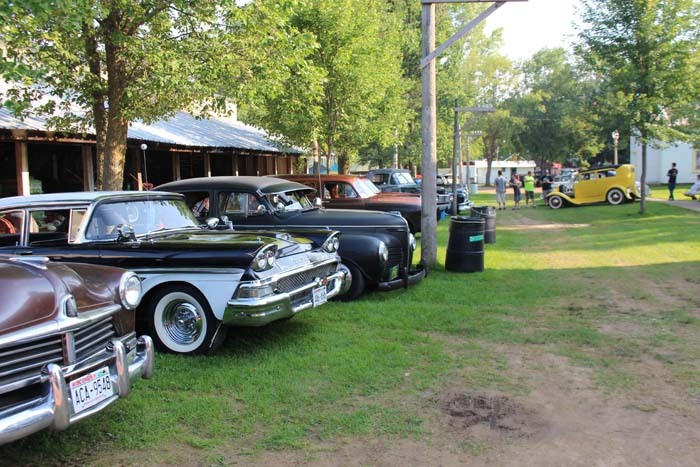 It's a weekend of hotrods and rockabilly music that takes place on the Union Thresheree grounds-- an amazing walk through history. Symco was formally known as Union. A local family, along with the Union Thresherman's Club began moving buildings to the grounds in an effort to preserve history, naming the little town Unionville. Buildings having been moved here from all over Waupaca County, to create a picturesque little town. There's more here than what I took pictures of-- I truly don't do it justice! I so wish I had gotten a picture of the general store, but I was too busy buying candy from the adjacent candy store (my poison of choice: PopRocks, candy necklaces, and multiple boxes of candy cigarettes-- I just love the chalky minty flavor of those, they're my favorite!). 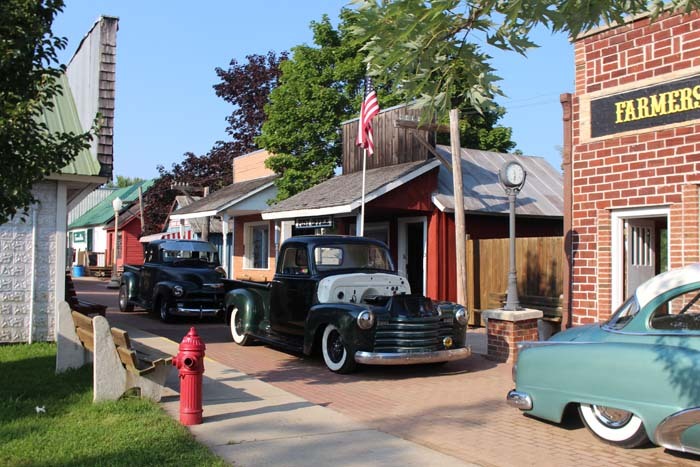 Each building is filled with antiques, authentic displays, and small (and sometimes big) pieces of the local history. There's a school, church, post office, blacksmith, fire department, barns, print shop, bank, shoe repair shop, and of course, a saloon! The Unionville Saloon was formally the Union town hall, and was built in 1896! Today it's an awesome place to grab a $1 cup of PBR and munch on popcorn. During Symco Weekender, classic cars litter the street. All my pictures are from Thursday-- a preparty to actual event. On Friday and Saturday, these streets were JAMMED with people, food vendors, and an amazing swap meet! This awesome bridge was moved here from highway 22, and overlooks the sawmill. These grounds were such a cool place to host this event-- it takes a normal car show and gives it remarkable charm. Of course, we aren't car people . . . we're camper people, ha! There were multiple camping locations (I heard a rumor that there were over a thousand camping spots sold! 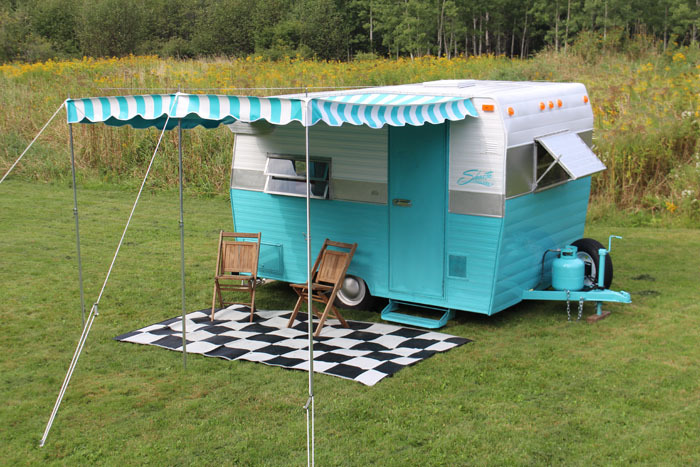 ), but the place to be was in vintage camping. 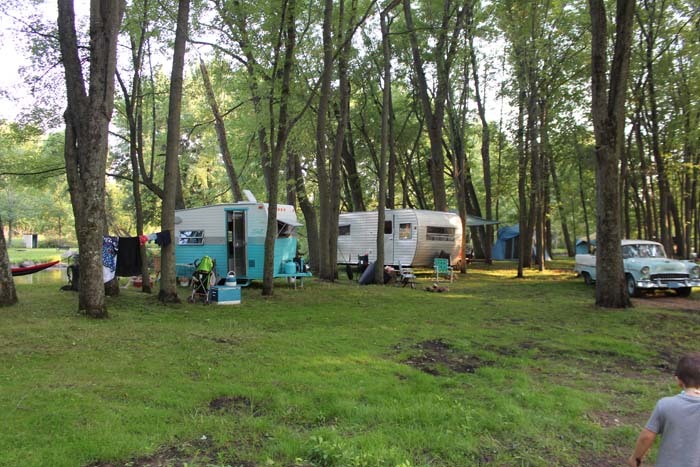 Vintage camping is located right in the show grounds, along the Little Wolf River. It's part of the show, and people would walk through and marvel at the old-time campers. 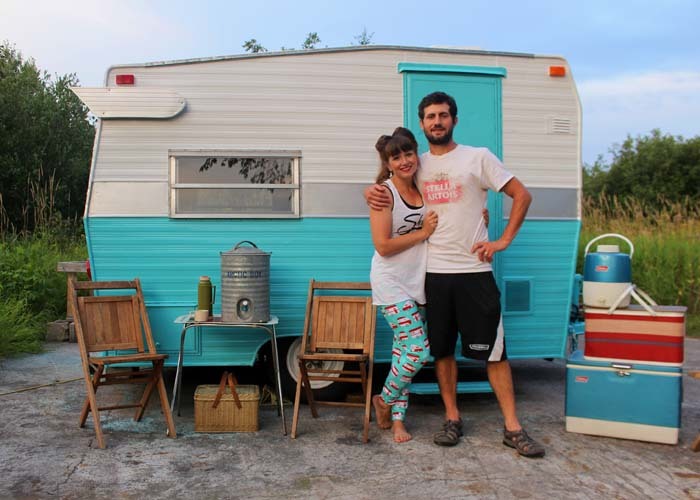 There were only about a hundred vintage camping spots available, and they went fast. You get priority if you went last year, and then they opened it up to newbies at the end of March. I was up at 4 am that morning with the baby, and I snagged a spot then . . . a few hours later, they were all gone (finally, a single reason to be happy about having to wake up ridiculously early with a baby). Vintage campers were required to be from 1970 or earlier, unless you got approved to be there (which I was, since ours is actually a 1972 . . . but it's essentially the same as the late 60s models). One of my favorite questions we were asked, as people checked out our Shasta, was, "So what did you tow it with?" They're expecting a super cool answer (it is a classic car show, afterall!). And my answer: a 2010 Grand Caravan. Ha! The van was relegated to spectator parking-- only cars that met the show criteria were allowed in vintage camping. But wow, being there made Mike and I dream about a sweet tow vehicle for the Shasta! I spent the day in rollers on Thursday, to have show-worthy hair on Friday! Lots of people got decked out in their vintage and rockabilly outfits (like yours truly), which makes it so much more fun in my opinion! The boys camped with us on Thursday night, and then headed to my parents' so Mike and I could have a kid-free weekend. Overall, it's a kid-friendly event, but as far as camping there and staying up late jamming to the full, amazing music line-up goes, it was so much better to not have the kids along. Mike: "Stop buying coolers and water jugs." 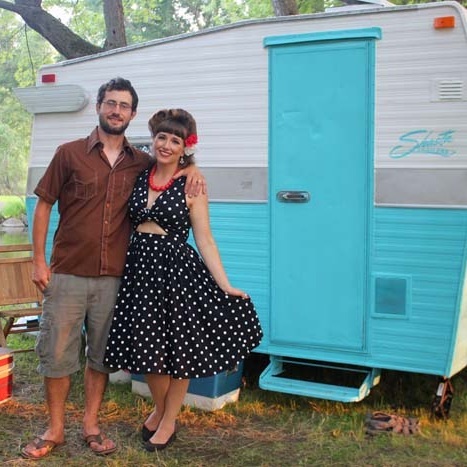 People in vintage camping decked their sites out! Lights, bikes, coolers, chairs, everything was classic! It was so fun just walking through the area and seeing everyone's sites. And everyone was so stinking nice. Vintage camper people are my kind of people. Mike and I loved chatting with everyone. It truly felt like the end of summer camp when we left, hugging my new friends goodbye, and saying, "see you next year!" My vintage camping skirt was an absolute hit! I got stopped many a time for pictures of that skirt, ha! Dressing up was half the fun for me. I even participated in my first pin-up contest (more on that tomorrow!). Poor Mike had to deal with a lot of picture taking, haha! And yet, I somehow didn't get enough pictures! The dance hall played rockabilly all night long, there was an awesome sideshow by Strange for Hire, and the swap meet was fantastic-- all of which I have no pictures of! It was an absolutely amazing weekend. It was quite the drive for our first time camping with the Shasta (especially when Mike was stopping every 20 miles to check the bearings). 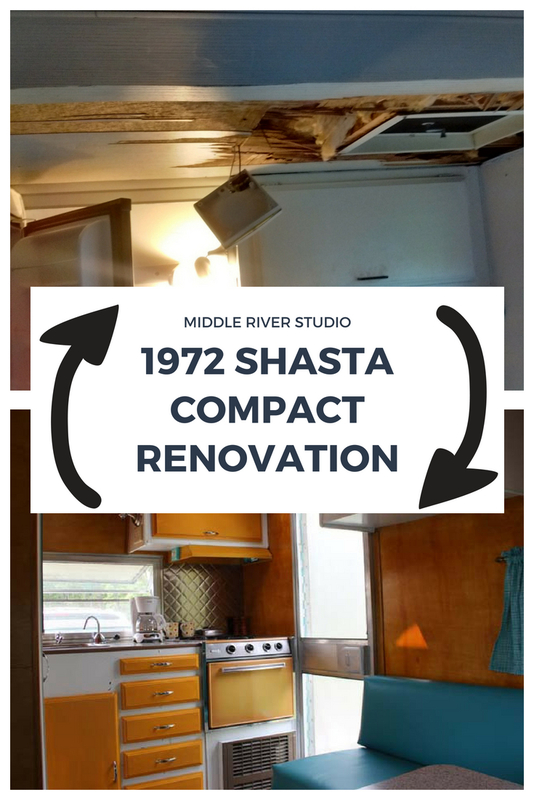 I know when we first signed up the for event, Mike was nervous about showing the Shasta off-- we love our finished product, but Mike was worried about being judged by the purists and professional camper renovators. But it wasn't like that at all! 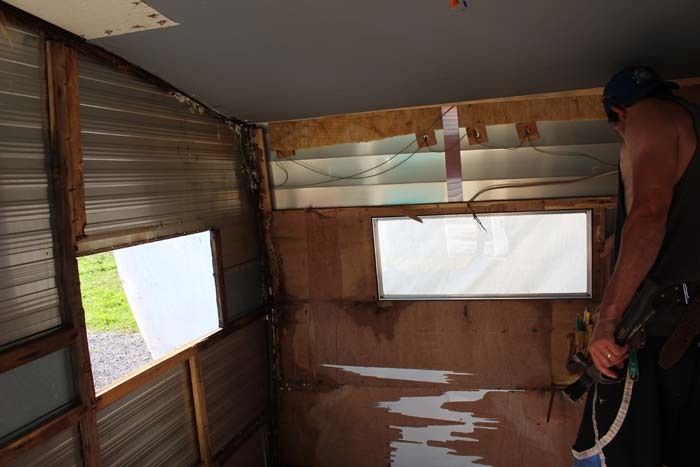 Vintage camping was filled with campers on all end of the spectrum-- from the completely gutted work-in-progress to the newly finished products. People were so nice and we got so many compliments on our renovation. 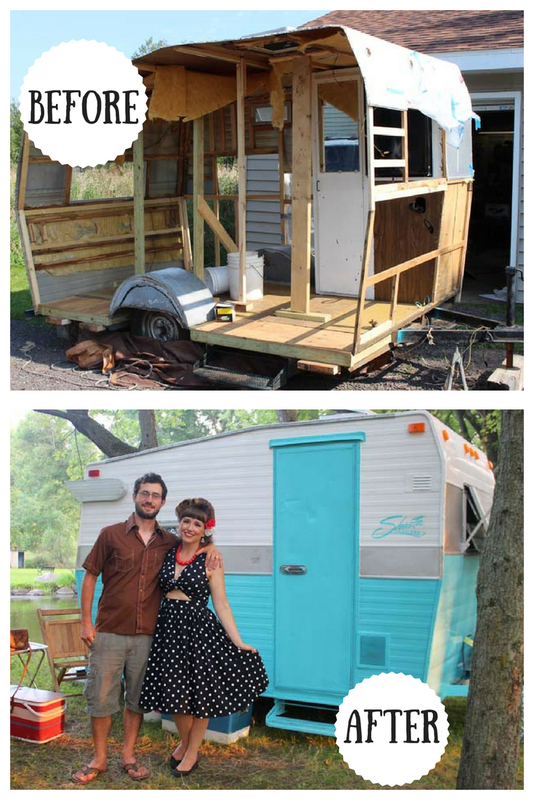 We were surrounded by people who understood having a project camper and the years (yes, years, plural!) of work that go into it. I kept saying to Mike, "these are our people!" ha! I'm going to start thinking of July as the lost month. I swear, every year, it FLIES by. Between the 4th of July, my birthday, hubby's camping trips, and general summery things, I blink and the month is gone, and I enter a state of panic as summer is slipping by and there's still so much I want to do. 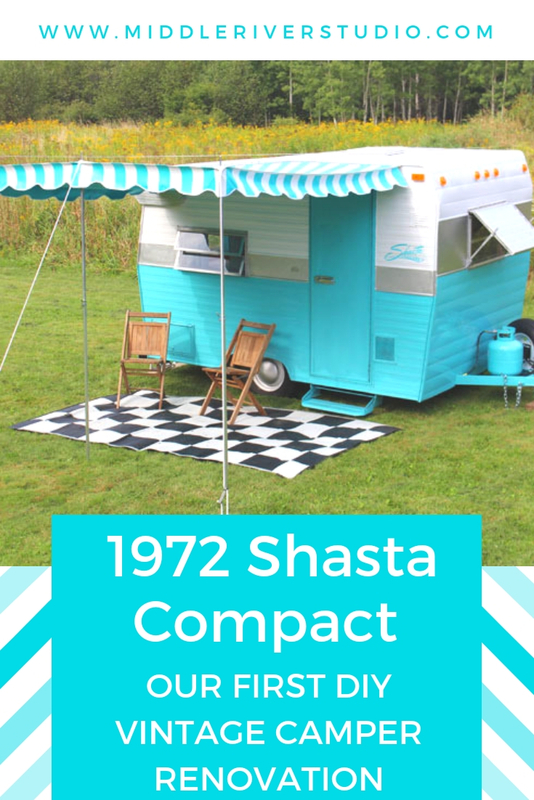 This summer, getting this Shasta Compact on the road has been top priority. And time is ticking! We actually bought Miss Betty Blue here in fall of 2016 (picture above is from the day we brought her home). At the time, I thought for sure that we would get it done and be road-worthy summer of 2017. But then we bought a rental unit, and that took priority. So, we (and by we, I mean Mike) only worked on it for about a month last summer before we wrapped her back up for the winter. But we're back at it and she is looking SO GOOD! I can't wait to share the whole renovation with you. 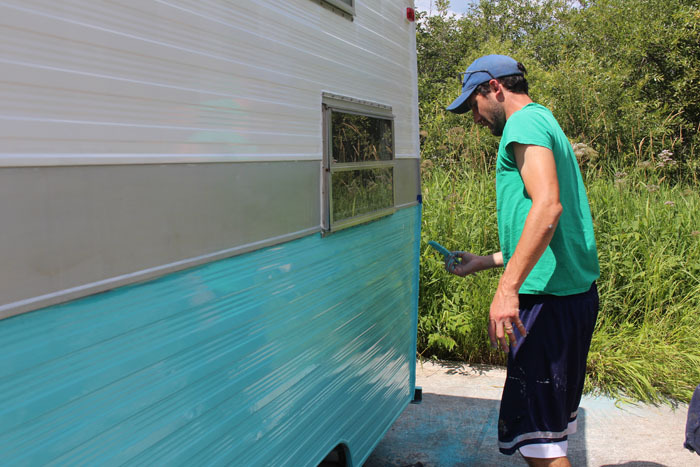 Her inside is almost done and Mike is working on painting the outside right this very moment! Well, with all of this vintage camper excitement, naturally, I had to start putting together some cute outfits to go along with it. I started shopping repro and vintage sites, sewing up vintage-inspired patterns, and buying all the cute vintage shoes I could find. I used to LOVE shopping vintage, but over the years I let it go. I have been so excited to get back into it. All of this fun deserved a new section here on my blog-- Vintage Life. 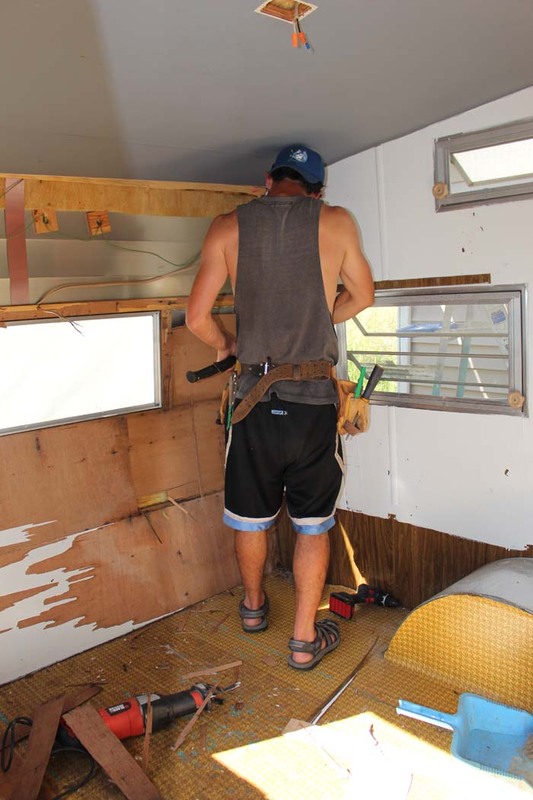 Here, you're going to find all the details on our camper renovation, my vintage-inspired styles, and our Shasta events (Our first show is in August. . . I'm even participating in my first pin-up contest! Eeek!). So, welcome to Vintage Life at Middle River Studio!